This one gets filed under the “things that sound pretty weird but are actually delectable” category. In case you don’t think cauliflower, tomatoes, and feta sound that weird together, why don’t you throw some capers, honey, and cinnamon into the mix. Weird enough for you yet? And how, you might ask, does this combination add up to a gratin? Isn’t a gratin made of milk and cheese and bread things? Let me explain. 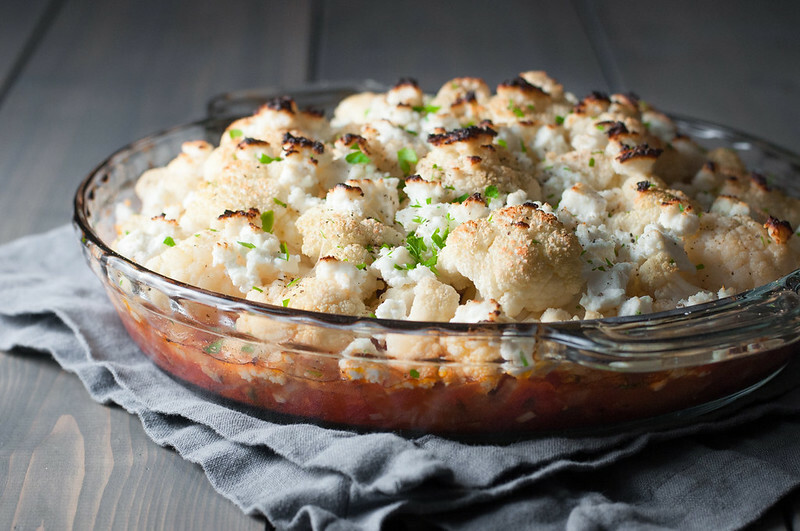 Greek tomato and cauliflower bake (or in Deborah Madison’s words, cauliflower gratin with tomatoes and feta) is basically tender, golden, roasted cauliflower atop a layer of Mediterranean tomato sauce, finished off with creamy browned feta cheese. The sauce reminds me almost exactly of my favorite veggie moussaka recipe, except I get all that exotic-tasting tomato goodness without two hours in the kitchen and a bajillion calorie layer of thick béchamel. In the world of swimsuit season and my-wedding-dress-is-going-to-be-here-soon, that’s a win. Honestly, it wasn’t a win at first, though, and I actually thought I had another failed gratin to dispose of. The tomato sauce was delicious all along, but the original recipe from The New Vegetarian Cooking for Everyone totally underestimated the cooking time for cauliflower. It was like eating browned but crunchy cauliflower, doing the tomato sauce a total disservice. Luckily (for Steve) I’m not one of those cooks who insists everything I make is wonderful. He and I both knew it needed work, but it was dinner, so I’m thinking we filled up mostly on salad while I rattled off a million things that might have gone wrong. In the end, it was easy to fix for leftovers–I just covered the pan and baked it so the cauliflower would steam. It worked like a charm, and now you don’t have to go through the pain (and I mean pain) of crispy, nearly-raw cauliflower bake. Tomato and cauliflower bake is awesome for a cooler summer day, letting you take advantage of those awesome seasonal tomatoes and fresh herbs. Basil sounds like it would make a tasty addition if you have it. For a cheesier cold-weather cauliflower gratin, be sure to check out this one with smoky (duh) smoked cheddar. And whatever season you’re in, my recipe index by ingredient can help you make use of your fresh produce. I’m writing this post a little ahead of time, because today, I’ll be in NYC seeing U2 live for the very first time. Talk about a kickoff for birthday week! I mean, I am turning 30 so I gotta go big. It’s all downhill from here…totally kidding. I truly could not be happier at (almost) 30, having the opportunity to run my own business doing what I love, and navigating life with the most selfless, fun co-pilot ever. It’s a big year ahead and I’m as ready as I can be for it! 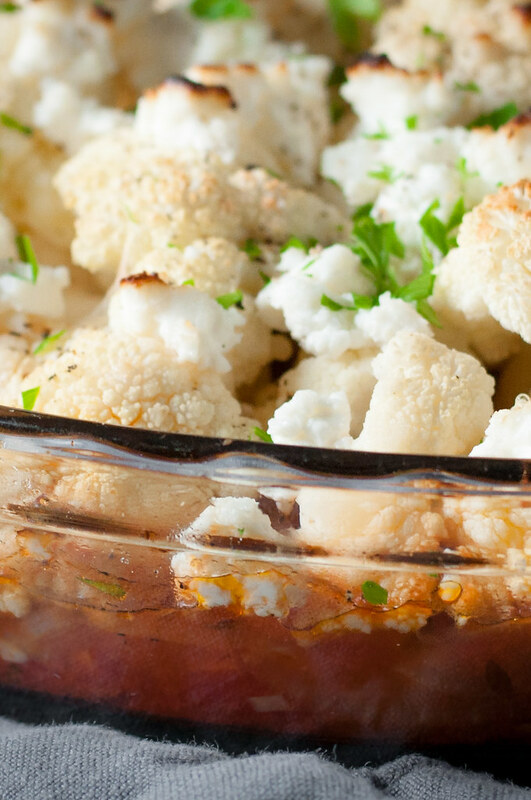 Golden roasted cauliflower and creamy melted feta cheese baked over a bed of quick, homemade chunky tomato sauce with exotic middle eastern flavors. Preheat oven to 375 degrees (F) and lightly oil a 9 inch pie plate. Prepare water and a steamer basket in a medium saucepan. When water simmers vigorously, add cauliflower, cover, and maintain a simmer. Steam about 10 minutes, or until just tender--neither crunchy nor falling apart. While cauliflower steams, start preparing the tomato sauce. Heat 2 tablespoons oil in a 10 inch skillet over medium heat. Add onion, garlic, dried oregano (if using fresh, add with tomatoes), and cinnamon. Stir and cook until onion is softened, about 5 minutes. 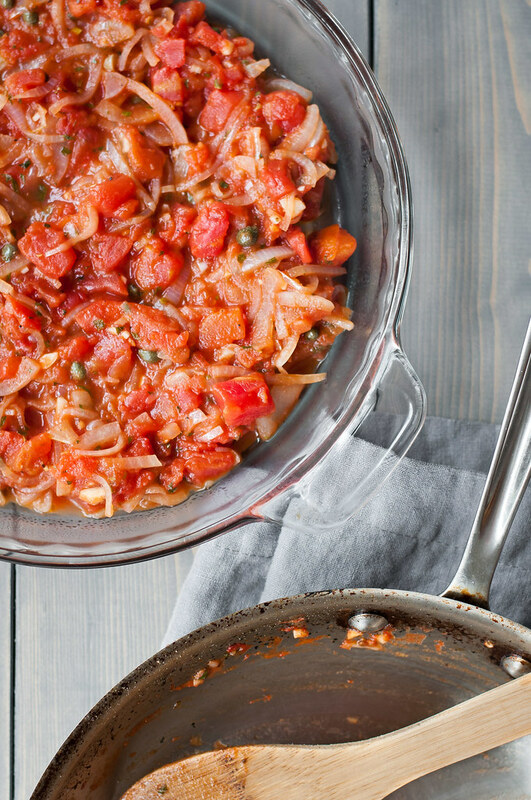 Add tomatoes (and fresh oregano, if using) and simmer until slightly reduced, stirring often, 7 or 8 minutes. Add honey and capers, simmer for another 30 seconds, then remove from heat and season to taste with salt and pepper. Spread tomato sauce in the pie plate. 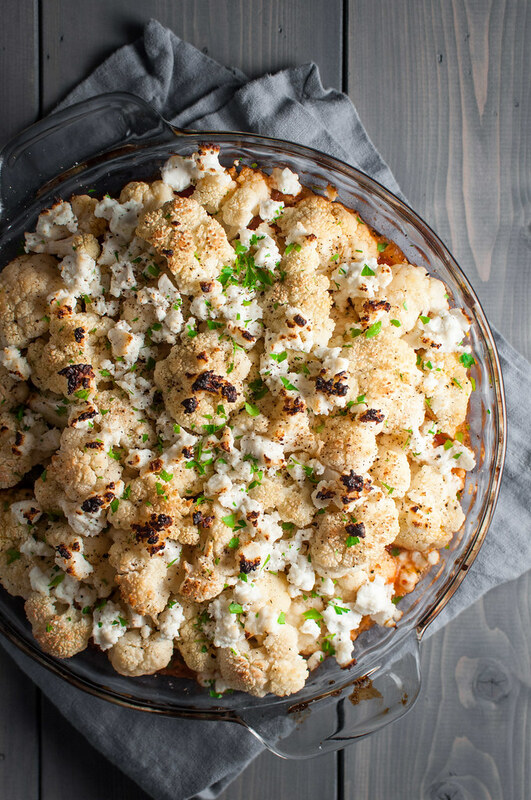 Arrange cauliflower over tomato sauce, sprinkle with salt and pepper, and drizzle with lemon juice. Cover with foil and bake about 15 minutes, until cauliflower is very tender and the sauce bubbles. 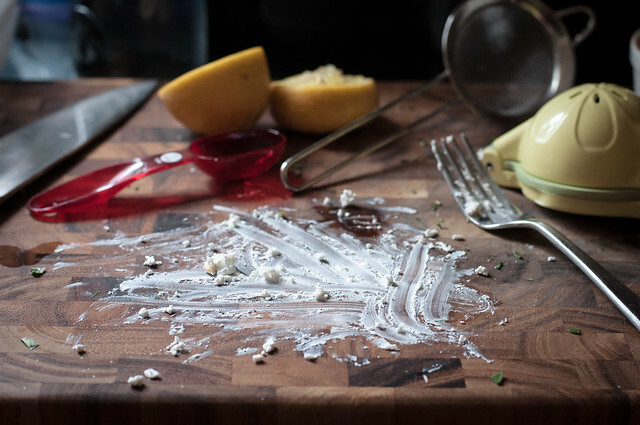 Remove foil, sprinkle feta over the top, and broil 3 to 5 minutes near the broiler (watching it carefully), until feta and cauliflower are beginning to brown. Garnish with parsley and scoop onto plates to serve. Servings needn't look perfect--it tastes best when everything gets stirred up together on the plate! Recipe is vegetarian and gluten-free. To make it vegan, omit feta (you might try adding a bit of nutritional yeast to the tomato sauce) and substitute maple syrup for honey. Maple syrup may taste more sweet than honey, so start with ½ teaspoon. Adapted from The New Vegetarian Cooking for Everyone, as part of my gratin chapter cook-through. The bake can be assembled ahead of time (probably up to a couple days). Extend cook time until everything is heated through. Note: This page contains affiliate links. It does NOT contain sponsored content. Affiliate links (to products I recommend, on Amazon) offset my ingredient and website maintenance costs, so I can keep bringing you exotic recipes like this one. Thanks! Thanks so much Alison…I’ll need it! Happy early birthday! I love the combination of flavors in this gratin, can’t wait to give it a try! 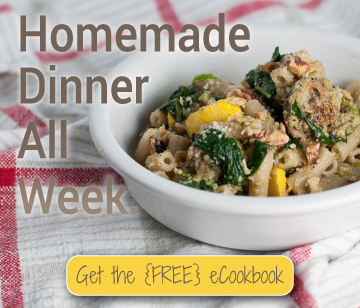 Free one week dinner plan eBook with subscription!